The clog Wash'Go is the perfect solution for those who are fed up with the rubber, or you prefer the comfort and smoothness of the leather. Because it combines the best of both materials: smooth as only the skin natural can be, and easy to clean as the plastic materials (the washing machine, and point). Manufactured in soft natural leather, with lining microfiber midsole and PU (polyurethane, very light, flexible and resistant). They are soft, lightweight and with removable insole.Ensure a perfect fit thanks to their belt loops elastic (feel like a glove whatever your forefoot). Shovel-sealed for added safety anti-fluid, but 100% breathable thanks to the natural skin. With a very pleasant touch for your microfiber lining. 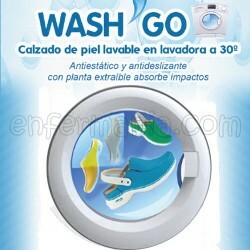 You read that right...you can wash them in washing machine up to 30 º c and it'll be perfect!! 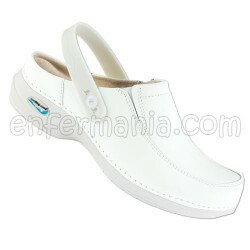 Take advantage and fit the shoes more innovative, because NOW THE LEATHER ALREADY HAS ALL BENEFITS.